Hopewell Eating Disorder Support Centre offers services and supports to those who struggle with an eating disorder, and to the family and friends who walk with them on their long and difficult recovery journey. Hopewell Eating Disorder Support Centre offers services and supports to those who struggle with an eating disorder, and to the family and friends who walk with them on their long and difficult recovery journey. This includes three unique support groups, offered in eight-week sessions throughout the year: a closed group for individuals who are new to recovery or who may need a more structured setting; an open group for individuals who are more established in their recovery; and an open group for friends and family members. Hopewell also offers a mentoring program, where a mentor who has been successfully recovered for over three years meets one-on-one with a mentee who may benefit from help when adjusting to life after treatment. Equally important, Hopewell provides a vital outreach and education function, to try to prevent these deadly diseases from developing in the first place. 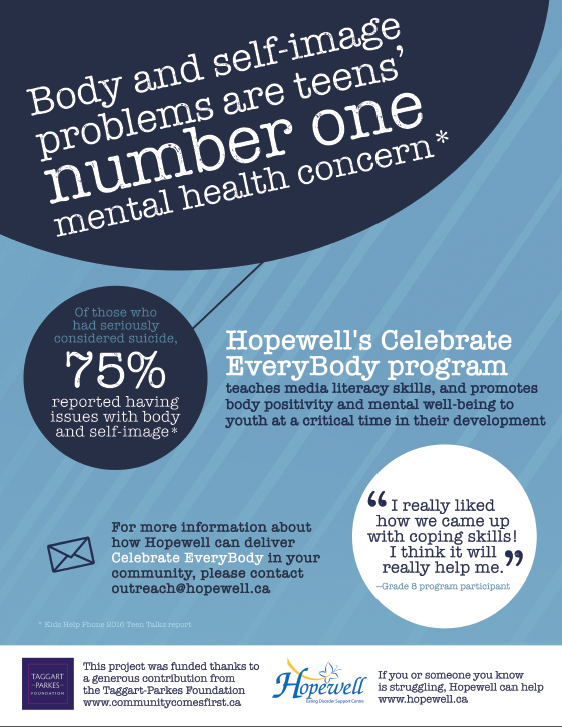 Hopewell partners with schools and community organizations to talk to youth about media literacy, positive body image and selfesteem, and mental well-being. These messages are essential for young people to receive, since many face constant bombardment over social media with images and messages telling them they just don’t measure up – whether that be in appearance, social status, or otherwise. Hopewell relies almost exclusively on the generosity of individuals and organizations in our community to keep fighting against these illnesses, which are the most fatal of all mental health diagnoses. Our community based supports and services are vital in assisting those who must navigate the complex mental and physical healthcare system, and yet Hopewell does not receive funding from any level of government. In the coming years, Hopewell is interested in exploring the feasibility of leveraging new technologies to provide on-line support for individuals who are struggling with an eating disorder. When you donate to Hopewell, a little goes a long way! For instance, a donation of $20,000 would cover a significant portion of Hopewell’s yearly program development and delivery expenses. A donation of $10,000 would cover our very modest annual rent, so we can target funds towards better serving our clients. And $5,000 would help us to continue offering prevention, education and outreach initiatives to local youth. are usually in their final year of a graduate program in social work or psychology. During this nationally-recognized awareness week Hopewell undertakes awareness and fundraising activities throughout Ottawa. This is a global day of activism and awareness-building. In September 2017 we hosted the themed event “Breaking Bread, Breaking Stigma” on the grounds of the Canada Agriculture and Food Museum, during which four of Ottawa’s top culinary talents competed to be crowned the “Sandwich Sovereign of Ottawa!” Keep an eye out for our 2018 fundraiser!